Proraso Shaving Soap, Refreshing and Toning formula, is formulated for any skin or beard type and provides a rich, creamy lather to prepare skin for a close shave without nicks and cuts. Eucalyptus purifies and tones while menthol adds a refreshing, cooling sensation. Made with a special "hot soap" process, it's left to mature in small batches for 10 days, during which the moisture evaporates, and the product becomes solid and more concentrated -- perfect for a professional-quality shave with a brush. Cruelty-free, with 91% of ingredients of natural origins, and of course, there’s no parabens, phthalates, silicones, mineral oils, artificial colors or sodium laurel sulfate. 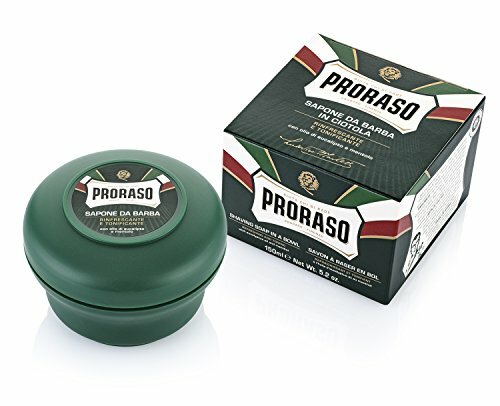 Originating in Italy, Proraso has been helping men achieve a smooth shave since 1948. Over the years, our line of men's shaving products has become a staple of Italian culture, and evolved to feature natural-based formulations without mineral oils or artificial colors. Nourishing botanical extracts and natural oils protect the skin before, during and after shaving for an irritation-free experience. If you have any questions about this product by Proraso, contact us by completing and submitting the form below. If you are looking for a specif part number, please include it with your message.